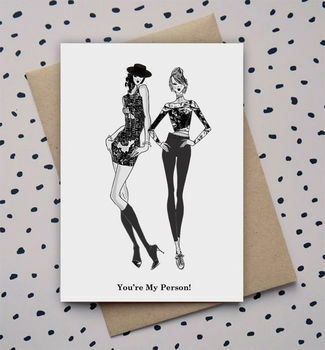 You’re My Person…. Birthday Card. Requested personalised quotes and sizes are available. Just get in touch. Lovingly packed in a sealed celophane sleeve and sent in a hard backed envelope. A6 in size and printed on quality 300gsm smooth heavy weight FSC certified card stock from Britain. Left blank for your own personal message. This card includes a beautiful A6 Kraft envelope. These prints are also perfect for creating those much desired wall galleries or adds a pretty addition to any room. This product is dispatched to you by Girl Limit.